"Mike" sends us a note to point out that the Evening Post has finally stopped going on about football stadiums and cyclists in shopping streets in nailsea, and instead focused on the key problem of the city: congestion caused by hundreds of students. As usual, we got our coverage in days earlier. If somebody is now surprised that it takes a while to get out of town by the M32 at 17:00, they don't know the secret routes through Broadmead or St Pauls. Tourists. Bristol Indymedia has some more coverage. While we are against students, obviously, some of them may go on to earn enough to afford decent cars -but with these proposed funding changes, they may be forced to walk, cycle or use public transport for many years after graduating. Documenting Stokes Croft is a full-time job. Which is why we have a company car, just like anybody with a proper job. And we like to park-up on the pavement outside Bank to monitor the competition. Not all cars are company cars, though. There's no way to tell if T31DYA is parked in the cycle lane to grab a legitimate and corporately funded bite to eat in Slix (or Mrs Lovett's), or if it just belongs to a local from City Road picking up a few extra copies of the Big Issue to sell in Clifton. The same is true for other cycle lane users, J44NUG, T364VCF and R790EDV. One thing is certain: these cars are not there now, which at least proves that none of the drivers, even if they had their hair cut in 'Anointed Touch', ended up as take-aways from Mrs Lovett's. These drivers are safe. We know that Stokes Croft is the centre of the universe. And at the centre of Stokes Croft is that most favourite eatery, Slix. Ignore the fact that it's next to Mrs Lovett's meat pie outlet, ignore any references to Sweeny Todd, or the fact that the Stoke's Croft is full of barber's shops. Probably more barbers than massage parlours. Even the venerable Croft features Harry Blades in the front room once a month at their heady "Barrymore's Pool Party" Nights - buzz cut for a tenner, anyone? No, the interesting thing about this stretch of inner city Bristol is the way in which users of the Bike Lane here generally form a parked string of pearls on an otherwise unused piece of road. Also interesting is the wide variety of patrons Slix appears to attract. So this week, in the spirit of a minor contribution to documenting the urban fabric of Bristol in 2010, we'll be celebrating a small selection of the trades that frequent the area. Lots of these vehicles are 4WD, but once you've hit the brake pedal, that's useless. Winter tyres then studded tyres (legal in Washington State during winter) and chains are what you should be thinking of. Otherwise, stay at home. Don't walk down the sidewalks on roads like this either. If you have a 2WD car with traction control features, when that light starts flashing it means "chains on". No chains? Pull over, park on a road that isn't so steep, walk. While a darkness falls over kingsdown as new yellow lines and pay-to-park machines pop up, Cliftonwood is holding out against the resident parking plans. As they must! Were resident parking zones to pop up with their neat little white boxes showing where people can and cannot park, the middle of Ambra Vale would certainly not become a "designated" parking area, so vehicles like J6SRY would not be able to keep their car safe in the road, away from pedestrians who could damage it. The same time we were getting a video of one driver, X108YDY, prepared to fight the anti-car city and use the secret rat-runs of Kingsdown, we were also getting some shocking footage of parents walking their kids to school. Some were clearly going on to cycle to work, so instead of driving their children to school in comfort and safety, they were being forced to walk alongside a bicycle -while the parents push them without even a helmet on! Others were actually encouraging their children to cycle to school. Such actions not only endanger the children, they threaten the bodywork of those of us who drive the wrong way down one-way streets as an alternative to traffic lights. Can't these parents see that we are in a hurry! Tesco's in Lower Redland Road re-opened a while ago now. But it may just be causing a few local problems. Nearby, another car, KL51UUY manages to get by unscathed. We have mixed feelings here. Yes, smart-car parking finds a new space, but it makes double parking harder, and this road is ideal for a bit of double-work. In Clifton Village proper, we can see the real problem: mud covered bicycles and their rides, taking up the pavement. by leaning them against dustbins. Apparently the Ashton Court golf course cafe no longer has its "no muddy mountain bikers" sign up. We say every cafe in the city needs such a sign. For some reason we could not get our van down Whiteladies Road and over to the M32 this afternoon, so had to divert up the hill and hit the Highbury Vaults for a few beers before continuing. One thing we could see was this police helicopter circling the university quarter, which may be a sign of student unrest. Students! Yes the government is going to massively increase fees for all future degree students, and take away the attendee allowance for anyone in higher education colleges. But the collapse of the economy implies the chances of you being in the payback part of the scheme is much less likely than you think! Furthermore, this government has abolished all funding for speed cameras! For that reason alone, we cannot come out and support you. That and the traffic jams you have created today! Back in June we covered the unfair persecution of a motorist, purely because they had the temerity to park across a dropped kerb. It seems this sort of behaviour by uncaring, irresponsible council officials is still going on. Poor old YL04ZWW has been targeted in the same way, with a ticket on two successive days. Our roving reporter did re-visit the site on the third day, but sadly the Mini had gone. We suspect the evil council took it to the car-pound to be crushed, but it could be (this is Redland after all) that some kindly neighbour contacted the owner, who then flew back from Barbados, and parked somewhere else. We just hope it wasn't here, where unlucky R125SLB, has also been persecuted for nothing more than inconveniencing a few children on their way home from Redland Green school. I love Christmas. Especially the oversized tins of chocolates that have become so symbolic of the festive season. As soon as Christmas season officially begins at the end of August I always make sure I buy at least three tins. One for the kids and family, one to keep on the passenger seat for those long winter commutes and one to store in the space where the spare tyre used to be in the boot. So imagine my disappointment when I went to fill in a form to win some "quality streets" and found out it was actually just a devious plot to subvert people into fuelling the war on the motorist. Save our rat runs. Ignore the following website. We know it's illegal to pretend to be police, but is it illegal to put out fake police warning signs? Look at this sign here in Cliftonwood, telling off a car for parking on the pavement. Now look at the car. One wheel up. Over in Monty the fact this car was sticking so far out would merit attention -that it was stopping through traffic, not supposedly interfering with pedestrians. It has to be fake. October's bike park movement on Cotham Hill was apparently to help the local cafe -the one that is being repainted as "manga manga" have some outdoor seating. Well, we don't know or care about that, but one thing that does interest us is whether the newly positioned bike parks do enough to discourage walking? The combination of some seemingly accidentally badly placed bike racks with some shopping signs put out for passing cars does make it very hard indeed to walk across this road, and so should discourage students from doing so. FirstBus and we motorists will benefit from this, obviously. But does it work? We can still see people trying to squeeze past all the furniture. The bike racks make cyclists feel welcome, even if the one we see is heading towards a junction which we hope the GBBN proposals will make impossible for them to cross. Furthermore the other side of the road is still open to pedestrians, and if they can't skateboard down the pavement, they just switch to the road instead. It may make walking less pleasant, but it isn't enough to stop the locals and students from getting in our way. We posted a while ago about the Emergency Services, and we're pleased to be able to report that the Manor Park emergency service has now acquired a second vehicle. The addition of M758XWS to this essential 24 hour service must be a good indicator that the economic recovery is well underway. Whilst we are always happy to park anywhere we want, there is a downside, as WU58ZFR demonstrates. This is the Downs, where thankfully no cycling is allowed. The problem is that if you can park a car on the grass you can also put a bin on the grass, which is a real waste of parking opportunity. We love taking visitors from the US through Montpelier at speed, watching them in teror stamping the ground where the brake pedal should be, as we drive our van through at 40 mph with millimetres between us and the parked cars on either side while texting ahead to our destination. But sometimes we like variety, and other fun place is Cornwallis Crescent and Clifton Vale. That blind Z-bend/T-junction when you are coming up the hill is fantastic. No visibility, you have to get the line exactly right or you get stuck. This week we are making it more entertaining by making our US visitor cycle round, so watching someone from "cycle-friendly Oregon" encountering urban UK roads, so we took the opportunity to take them down this and see if they'd survive. Descending from Goldney Ave: hold back until you see a gap, then commit, but swing out before turning in, Alpine style. This early swing out ensures that you finish the turn on your side of the road, which is better for bad visibility situations, and here, ensures you can get round. Coming from Cornwallis Crescent: head through, don't show weakness. Coming up from Clifton Vale: head up, keep left ready to swerve right into Goldney Ave.
After the entertainment of a car having to back up twice, our U.S. tourist gets the give way markings wrong and almost loses out to the car on Corwallis Crescent. More importantly, by waiting where he is, he's lost visibility of what's happening on Clifton Vale, which can be tactically unwise. This time, he survives as the cars in front have stopped motor traffic heading up, but next time may not be so safe. People have been mailing us, where is the Yoghurt Van YA55VDY? Has some disaster struck Bristol's supply of dairy goods. The answer is no, the clocks changing just altered its schedule. It doesn't pull off without indicating from the buildout by Whiteladies Gate until 08:10 now, helping to remind the driver of the honda SUV why buying a vehicle that may survive a collision with a white van was a good decision that makes school runs safer. Note how the driver actually waves our (sadly cycling) reporter. The proposed GBBN changes may make it harder for this van, as the buildout may not be so large. While we can't see from the design whether or not bollards are planned, we fear the worst. St Pauls School Run problems. By way of the Legacy Printed Press, we see this video of a car being forced to push a Ford Ka out onto the road by the school entrance to Cabot Primary School. The comments on the E.P. Article are pretty polarised. On the one hand, this is someone exerting their right to get their car out of the garage despite the selfish actions by lazy parents who themselves park on the keep clear zones just to drop the kids off faster. On the other, this is someone potentially endangering children who if not walking to school, are being dropped off by their parents outside it and expected to walk across a road. It's hard to say who is most wronged here. The Bristol Traffic Project is a Big Society project, a community database of those people bold enough to stand up for their rights in an anti-car city. Today we are pleased see it at work. This is Marlborough Hill, "nominally" one way. We say "nominally", as it is wider than most two-way streets in nearby areas. While over in Waltham Forest, Freewheeler complains that one-way streets increase traffic speed, our niggle with it is that it increases the expectation by cyclists that they should be on the road. Look at this video of the polish-plated BMW KTT86LT heading doing a bit of contraflow on Marlborough Hill. The driver is giving way to cars coming up the hill, on the narrow one way bit he even slides to one side to let the bicycles up this 1:5 hill. Yet are the cyclists grateful for his generosity? No, they abuse him. At least he is generous enough to laugh politely while shaking his head, but then he is probably in a hurry. Why else take this contraflow rat-run on a Sunday morning? Returning to our community database project, note how we always omit spaces in registration numbers. This makes it easier to index them in large distributed column tables and other fancy servers, which makes it easier to find them in the search engines of our strategic partners, Google, Microsoft and Yahoo! included. Today we can see that KTT86LT has already been seen in Stokes Croft. We are slowly building up our dataset on who is prepared to stand up against the oppressors -and who the little people are. If you have not yet had the honour of being on our site -you are probably one of the little people. Our commentary yesterday hinted at bus problems in Crow Lane, as a result of criminal activity in the area. Over here leafy Redland Road this is less of a problem, and the brave owner of EF59VBA is even comfortable leaving the Volvo half on the pavement. The problem here is not muggers, but bus stops. This bus stop in particular, and the one nearly opposite it, where poor people, the young, the old, students and those awful busy bodies from Transition Bristol stand and wait to catch their sustainable transport down to Temple Meads. This means that those of us with a proper job, and car to match, have to suffer huge tracts of perfectly good parking provision removed from use, just to accommodate a bus stop. Just how selfish can these people be? Why is that unusual? Well, FirstBus are stopping buses coming past here from 18:30 onwards as it is too dangerous -the drivers keep being robbed. They may go through the area, but they won't stop. On the back of this bus is a mural encouraging people to walk. Sensitive that. Another issue we had with the Russel Square area is that this marked a clear attempt to bring cycle-friendly infrastructure into the inner city, rather than, as in Bristol, leave it places where we hope it doesn't get in the way of anyone important. Full green bike paths, with raised kerbs to make it slightly harder to accidentally park in them. And here, worst of all, an "except cycles" get-out clause on a one way street. Not "except cycles, taxis and van drivers", but cycles only. What is really depressing here is that the Camden council staff behind such schemese visited the proposed GBBN Whiteladies Road development, the one that will help motorists driving in to town by removing the zebra crossings in our way and making cycling more dangerous. We know this as we infiltrated the event, keeping track of what people were saying, and whether complaints were being dismissed -as expected- or actually listened to, and tried to slip our own ideas in to distract them. On the topic of that camden council cycle team visit, can we extend our apologies to the woman driving the green nissan micra down WL road who was held up for fifteen seconds by the funny bicycle people. Yes, you were right to beep your horn at us for not being in the bike lane, even though cyclists don't have to cycle in them, they can cycle two abreast legally, and the traffic jam ahead meant you weren't losing any time. Yes, you were right to complain that eight people on bicycles at 08:50 on a weekday were causing utter chaos, which is why the local council had arranged the cyclist visit to during the quiet period mid-morning. Sadly, some of the cycle troublemakers had spotted the flaw there and pressured for a rush hour visit, which is why you were held up by three people cycling two-abreast down whiteladies road. Because we were trying to blend in with these subversives we did have to come up and argue with you while you were stopped at the traffic lights, as anything else would have aroused the suspicions of the rest of the group. We didn't really mean to call you a selfish idiot who would clearly benefit from getting out of their car and trying to do some exercise! It's your right to get fat and stay unfit by driving to work and back, stopping only in the supermarket to buy ready-to-fry fast foods. We didn't really want to dispute the niceties of the highway code and the fact that nowhere in it does it say "bicycles should be banned from our roads" -because like you, we think it ought to! It was just something we had to do to blend in! Crap Walking and Cycling in Waltham Forest recently popped over to inner London to denounce the area for having a parking space. Interestingly, this bit of the city exists in our database, but it was actually so depressing to us we hadn't bothered to put up. Look at this, Malet Street, the heart of the student area, just E. of Russell Square. There is only one free parking space for electric vehicles. You are limited to parking there for 2h only, which is barely enough for a family-funded arts student to finish three cafe lattes. The fast moving bicycles endanger the paintwork on these premium vehicles. Yet to the left of the EV parking space, there is clearly enough space to put in four or five more charge points, enough to make a greener city. Yet it is taken up (even on a saturday) by a vast collection of bicycles -parked on our road tax funded roads- and a zebra crossing, again, tax dodgers stealing Road Tax space. Slightly south, a row of borisbikes on a pavement buildout. And in the university itself, some bicycle lockers for staff -even they are being encouraged to cycle. Paul Dirac -Bristol's greatest physicist, apparently moved from Cambridge to Florida in a dispute over allocated parking spaces. When are the London universities going to realise that the only way to attract and retain the best staff, and the most well-funded students, is by providing parking for motor vehicles? How, exactly, do we get our White Van from Cribbs Causeway to Baldwin Street if we allow something like this this to happen? Pedestrians with priority over cars? Just plain wrong. Along dovercourt road, we see a member of Keiths Driving School and a paying customer getting their paveparking right. Learning such skills are what makes the difference between a low-end driving school and a high-end one. We just hope that the driving examiner recognises the harsh truth about Horfield's parking problems, and doesn't live a noddy-land world where people park on the roads and even then not opposite junctions or within 50 feet of a corner. Everybody knows that there are no parking problems in Cliftonwood, and that is why its citizens recently rejected the imposition of a CPZ. However, what fewer people know is where the "secret" parking slots are - the ones that are normally free and you actually have to seek out. Here we see two cars demonstrating two of these slots - DY52OLC at the end of Randall Road, and NY54EWP at the bottom of Ambrose Road. What these camera angles don't show is that both of these cars have bits of paper stuck under their windscreen wipers. They were probably from admiring local residents congratulating the drivers on locating these hidden parking spots, but we'll never know - sadly, the rain has rendered them illegible! PS: In the case of DY52OLC it could be to apologise for the fresh dent in the back right hand corner. Whilst admiring the honesty of the perpetrator, we say: next time, use indelible ink! Unfortunately, the wronged car owner will never know who you are. Tax dodgers, parked for free, making their own entertainment. We can't do that, the best we've got in the X5 is sat-nav and Jack fm. Here at Bristol Traffic, we like leaving the 4x4 outside Somerfield all day, whilst walking into Clifton, pretending to be pedestrians. Unless we complain by 12th November, that'll all be over and they'll give our parking spaces to bicycles and buses, at least in rush hours. If you want to keep the free, 24 hour, inner city parking in Whiteladies Road you'd better get over here and make some comments. Quick. Yes we've seen this car before. The miracle that is an internet-scale index/search engine tells us we saw WR08HXK in exactly the same place in Chedworth Road, Horfield, back in March. Well, before your customers are ready for the pavements of Monty, you need to teach them how to get on and off the kerb safely, and quiet roads like this with plenty of dropped kerbs are ideal. One issue though: six months? And their customer is still learning? That's not good. Footage of someone on Cobourg Road managing to get their car out safely. This is why in inner city Bristol you don't want alloy wheels. They may be a status symbol for some drivers, but they are clearly not people who have to drive round the anti-car parts of town, where getting on and off pavements and skirting kerbstones are a regular part of every driving journey. They are a luxury for outsiders. We celebrate people who stand up against oppression, who fight an anti-car council in and anti-car city. This why we are proud to celebrate the driver of X108YDY as he drives down Marlborough Hill, from Kingsdown to Jamaica Street. For some reason he didn't seem to appreciate that he was on camera and thought it was a stokes croft weird person who had come up the hill, rather than a member of the Bristol Traffic reporting team. The parents walking their kids to school through Marlborough Hill Place and then the hospital car park were giving funny looks too, hence the explanation at the end that it's on camera. It is only by driving the wrong way down this street that motorists can get rapidly from Kingsdown and without getting stuck in traffic on Horfield Road. It should be made two way. Admittedly, there isn't room for two cars, but it's wider than your average Montpelier street, so why the problem? There it is, just near the end of the sequence. A big 20 mph sign on the road. And it's not just here, on Picton Street. The zone begins here, but spreads all the way to Easton. Even Ashley Vale is 20 mph in the bottom half. The high speed rat-runs like St Andrews Road will never be the same again, now that some sanctimonious cyclist or smug prius driver can pootle along in front and not feel guilty about holding our van up. One more video from our tax dodging cyclist, who we sent on a mission to get crushed by a bus on Whiteladies Road. For some reason they survived. Anyway, here is the video. Whiteladies Road from Lower Redland Road down to the triangle, Park Row and then towards Jamaica Street and Stokes Croft. This just reinforces our previous conclusion: that during peak hours the causes of delays on our route are not pedestrians, they are in fact the big traffic jam around the Triangle. This time, continuing past the Triangle, we can see that the traffic sources there are in fact vehicles heading up Park Street or those coming in down Park Row. Which we believe is our inalienable right to do, and even with this bus network, we will continue to do. Why then, do they want to mess around with the pedestrian crossings, the left turn by the downs into Redland Hill, or the right turn out of Cotham Hill -one that actually works well in peak hours because the pedestrians are triggering the crossings? That doesn't mean they shouldn't need a license, pay road tax and be insured, but that sometimes they have a place in our world. We just think there should be slightly less of them, and we should be exempt from stopping for them at zebra crossings. This video has gone up early so that the owner of a red nissan micra further along Cobourg Road has more details of the van YK57BHZ- that scraped their car on the way out of the road. The camera was off at that point, but that bit of pavement where your car was is narrower than this stretch, and as you can see here, it's a bit close, and one has to question why the lorry chose to continue, instead of going up to Fairlawn Road. Indeed, one has to question what it is doing in the area in the first place. At the end (above the camera), the top of the approaching van is touching the van heading away; people have to help push the smaller van's body away to reduce the scraping it would otherwise get. Clearly this is an anti-van part of the city, one where it isn't wide enough for two to pass each other, even when both are up on the pavement. So why don't the drivers' satnav units start sounding off the moment anyone picks up a route that goes anywhere near it, like those airplane collision avoidance systems that shout out "Pull up! pull up!" should do the same for any large vehicle approaching monty. With narrow streets and -soon- 20 mph limits, we've lost this part of the city. The final question about the showcase bus route proposals is will the removal of a zebra crossing at the bottom of Cotham Hill and a dedicated turning lane help school run parents turning off at Cotham Hill? Not if this video of a weekday morning is consistent. There's a jam all the way up the hill from Oakfield Road. Sometimes there is less of a jam, and then parents can safely pull over onto the bike lane without their fear of their children being hit by a cyclist as they drop them off at one of the local schools (St Peter and Paul's RC is the closest), then carry on to the parent's final destination without any detour. This is safe, provided the cyclists don't interfere. Today you can see that our secretly-instrumented tax-dodger swerved out of the bike lane, into the tax-payer's lane, forcing the car W153KDA to pull out aggressively to avoid being stuck behind them. We are secretly recording cyclists through the city, then buying them beers and finding out how their day was -as a result, we are starting to understand their (invalid) reasoning better. Here is Stokes Croft of a morning, the cyclist is waiting to turn right, and watching the two incoming lanes. Note how two cars get their lane choice wrong and decide to go straight on in defiance of left-turn signs for that lane. Yet still some tax-dodger decides to RLJ their left turn onto Stokes Croft. At 1:00, the cyclist gets their turn in, skids left onto picton street, passing a van on the pavement to their left. 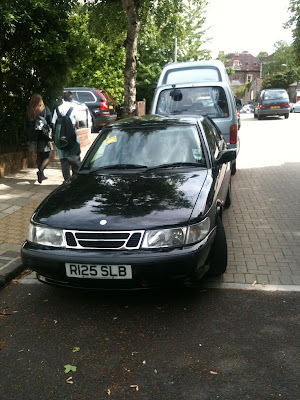 Some people think parking blocking the pavement is wrong, but in this part of the city it is that or block the road entirely. At 1:14 you see someone doing that, and you see the bicycle proceeding to the left of the van, despite the fact that in our post-mortem we can see the door opening, and the passenger forced to retreat by the passing bicycle. We understand why you wouldn't wait for the van; in monty that could be a few hours waiting. But why not go up on the pavement, the way most tax-dodgers would do. The answer to that becomes clear on a later video. You can be sure that a van isn't going to veer into the parked cars, but you can't be sure that they aren't going to swerve up onto the pavement and drive along for a bit. We see this hear on the "Richmond Road shared space", an area to the side of roads that would elsewhere be called by its old name, "the pavement"
The van graciously waits for the parent and pushchair blocking this pavement, and once gone gets up on it and carries on, before eventually parking. The cyclist then passes them, continues down to Bath Buildings and Cheltenham Road, where we can watch the chaos with bemusement. The first cyclist, the BMX-er dodging a turning car probably just ran orange, or was past on red but, well, slow. The second one, the one that nearly takes our our tax-dodger as they ride across the road, he has had 10 seconds of red before he goes. That's three cyclists and three vans in our camera. All three vans are trying to find somewhere safe to park, which anti-car montpelier makes excessively hard. Of the three cyclists in the video, two of them seem blatantly oblivious to red.